I have to say, I think this post is perfect in it’s timing. Halloween has just come and gone. Though this holiday is often equated with kids trick or treating, fun parties, and the inevitable parent tax on every bag of candy, it is also a day to celebrate horror and scare ourselves. I think the creepiest type of horror is the kind that grosses me out, gives me a sick feeling in my stomach while I grimace and look away. This post can be that for some of my readers I am sure. 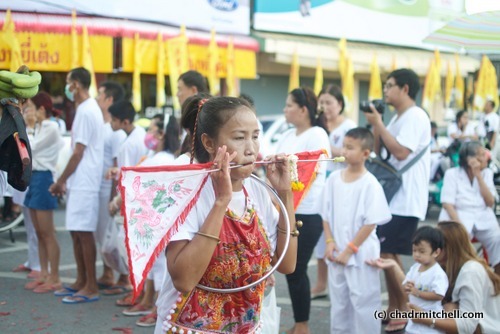 On Friday last week, I shared about Chad and I’s time at a Phuket Vegetarian Festival procession. I decided at that time to keep the pictures safe for anyone that may be reading. 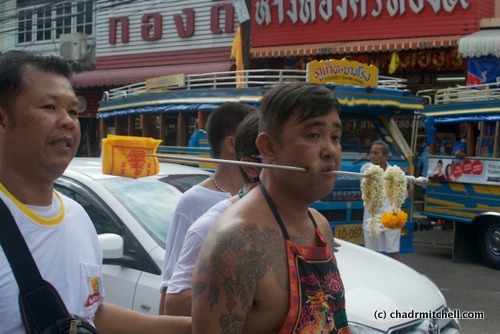 I understand that not everyone enjoys seeing people with swords, anchors, or skewers pierced through a person’s cheek. 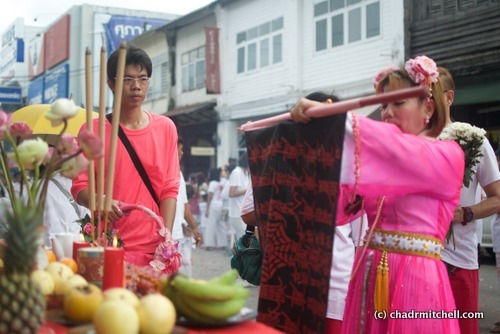 Today I am sharing Chad’s pictures of that procession. The photos are beautifully taken of a probably NSFW event. Be forewarned that some of them may be upsetting to you. Last Chance! Exit out of here and come back on Friday if you can’t handle body modification type pictures! This Ma Song was not pierced, she stopped to bless our friend and her business. This Ma Song was holding a child’s hand as he walked. 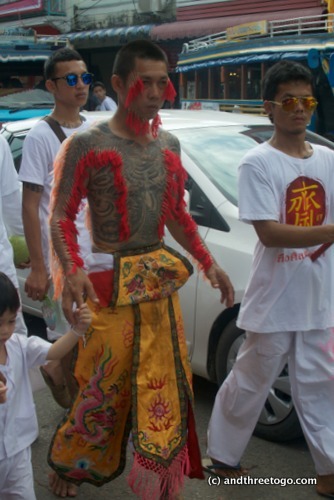 He was pierced all over his upper body and face. 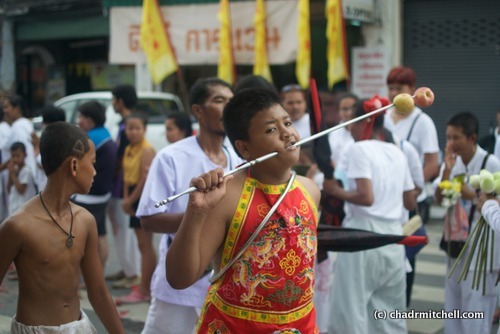 According to our friend who was born and raised in Phuket, the youngest participant in the procession this year was an 8-year-old boy. This young man looks older than that…but just barely. 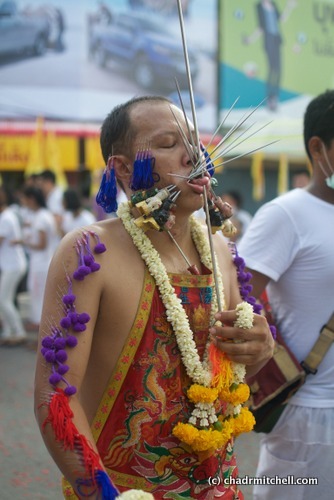 This gentleman was impressively pierced. 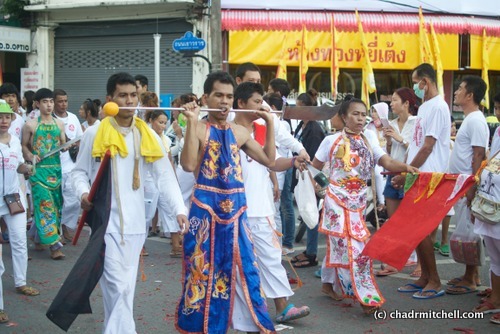 Our friend explained that the skewers with the soldier heads are spiritually the heaviest, that he is channeling numerous spirits. The fact that this man has many of them means that he must be very pure and strong. Tut tut it looks like rain… this guy is prepared! Haha. Sorry, I couldn’t resist. 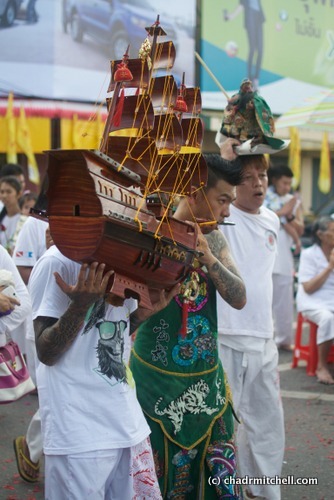 Yep, this Ma Song has an old sailing ship models figurehead (is that what it’s called?) through his cheek. A female Ma Song, with minor piercings (in comparison of course). I am not sure what the metal ring is that she is wearing, but I saw many Ma Songs with them. I saved the most impressive for last. A trio of anchors. Now mind you, the Ma Songs walked many kilometers (barefoot), these had to get so heavy. Crazy! Did you make it through them all? What did you feel or think? Leave a comment and let’s chat! Hi Jen, I went self hosting and have lost some wordpress.com functionalities and had some technical difficulties, but it is she of insaitama.com formerly known as japanorama formerly known as daysofourlives!! I am indecisive aren’t I. However, now that I have gone self hosting I guess I finally have some direction. Anywho!!! I made it through, just about and I really really appreciated the warnings. I prepared myself. The last 2 I had to half glance at – I got the gist, but I don’t know if I can claim to have seen them. However, the topic and the photos are fascinating and I am glad you shared. Hi Elle! I will have to subscribe to your new site! I can totally understand the indecision, i am still feeling that way with my web design business… Why do we have to choose just one name?!?! Ack! Haha. Oh my goodness my stomach did a few turns! The nurse in me is imagining all kinds of complications and trips to the ER! Wow! OUCH! I scanned through the photos real quick! That boy! Oh my. One word – eek!!! Great to see though but how do they bear it?? I have heard that many of them get some sort of injection before hand to send them into the trance state… But I have nothing to back that up. I could read about it the whole day as well and get conflicting reports and probably just confuse myself. Even when I asked my friend about it, who has been asked to be a ma song (she refused to), she couldn’t explain why it went from a diet change to piercing and walking on razor ladders. Hey! 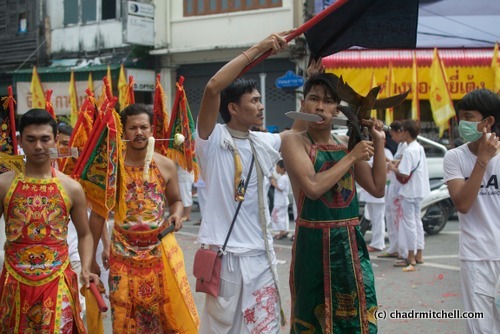 Isn’t this our version of Thaipusam? It is a great event here! 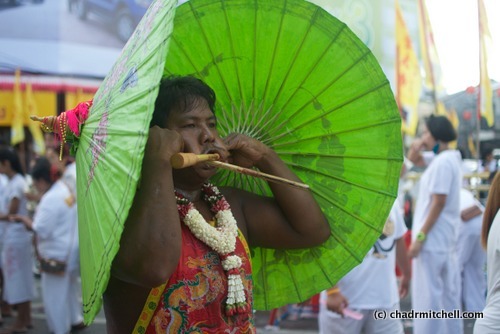 It is a Hindu festival celebrated by Tamil community. 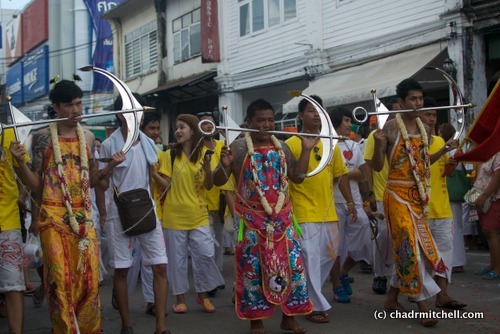 I didn’t know Phuket has something similar too! An eye opener and I notice the difference in piercing “accessories” too. Goodness me! Are they real? They look extremely painful and heavy! Good for them though. I wouldn’t want to do it myself but I’m happy to appreciate every type of beauty LOL! Victoria@ The British Berliner recently posted…Osnabrück – a medieval town in a German valley – the hometown of my German husband! They are all real. 🙂 Appreciation is definitely the route I took as well!